Over the past two decades, the use of nite element method as a design tool has grown rapidly. Easy to use commercial software, such as ANSYS, have become common tools in the hands of students as well as practicing engineers. 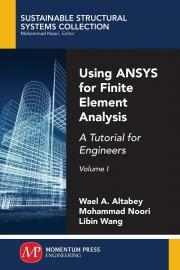 The objective of this book is to demonstrate the use of one of the most commonly used Finite Element Analysis software, ANSYS, for linear static, dynamic, and thermal analysis through a series of tutorials and examples. Some of the topics covered in these tutorials include development of beam, frames, and Grid Equations; 2-D elasticity problems; dynamic analysis; composites, and heat transfer problems. These simple, yet, fundamental tutorials are expected to assist the users with the better understanding of nite element modeling, how to control modeling errors, and the use of the FEM in designing complex load bearing components and structures. These tutorials would supplement a course in basic nite element or can be used by practicing engineers who may not have the advanced training in nite element analysis. Wael A. Altabey is an assistant professor in the department of mechanical engineering, faculty of engineering, Alexandria University, Alexandria, Egypt and has been a postdoctoral researcher at the International Institute for Urban Systems Engineering, Southeast University, Nanjing, China. Libin Wang is a professor and the dean of the school of civil engineering at Nanjing Forestry University, in Nanjing, China. He has been an educator and scholar, for over 20 years, and has taught the subject of nite element analysis both at the undergraduate and graduate level.